Being vegan is a commonplace these days with more and more people hopping on the “no-meat wagon” with each passing moment. Since many folks express health concerns about this kind of diet, one of the frequently asked questions to vegans is “Where do you get your protein?” Of course, such a question is justified, and the good news is that there are many plant sources of protein, with beans being one of the best. 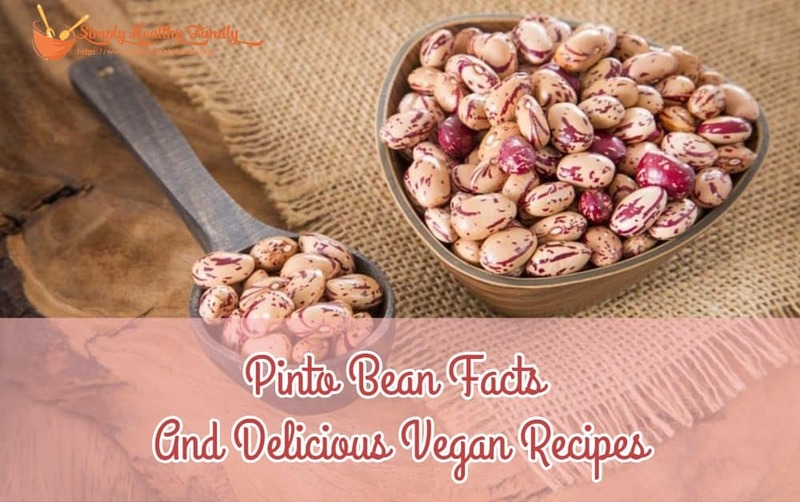 Today we will focus on pinto beans, their history, benefits and finally some amazing vegan recipes that include these pink-brownish legumes. The history of pinto bean cultivation goes back thousands of years to the ancient civilizations of Mexico and Peru. In the 15th Spanish explorers who were returning home from South and Central America brought these beans to Europe, and from there they spread to Africa and Asia. They fall into the category of “common” beans along with their cousins like kidney beans, navy beans, Great Northern beans, etc. However, one thing that sets pinto beans apart from the others is that they contain the most fiber out of all popular beans eaten today. 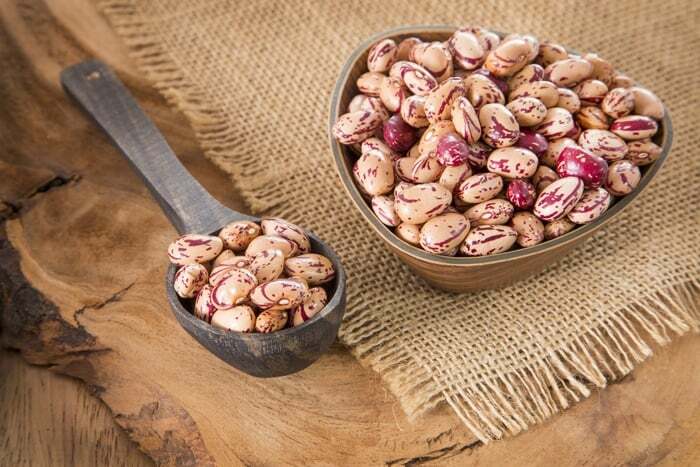 Now that we’ve learned a bit about the history and gained some basic knowledge of the pinto bean, it is time to talk about the health benefits of this wonderful legume. As mentioned before, a major concern for some vegans is how to intake a sufficient amount of protein on a daily basis. Pinto beans are a fantastic source of lean protein, meaning that, contrary to meat, they contain almost no fat in their structure. About 100g of chicken or fish will provide you with about 20 to 25 grams of protein, whereas 100g of pinto beans (uncooked) contains around 21 grams of protein. As you can see, the numbers do not fall far behind. If you search for a list of foods high in fiber, you’ll discover that beans are on top of it, and the pinto bean contains THE highest amount of fiber out of the entire bean family. Why is this good? Well, fiber plays an important role in our digestion and the processing of food in our body. Also, fiber can also regulate blood sugar levels and lower cholesterol. It promotes stool bulk and helps to prevent constipation which is a struggle many people face. Just one cup of cooked pinto beans contains about 15 grams of fiber which is 60% of the recommended daily fiber intake for a 2000 calorie diet. Iron is one of the main minerals that regulate our energy production and metabolism. It is especially important that menstruating or pregnant women intake enough of this element, and pinto beans are a fantastic source. 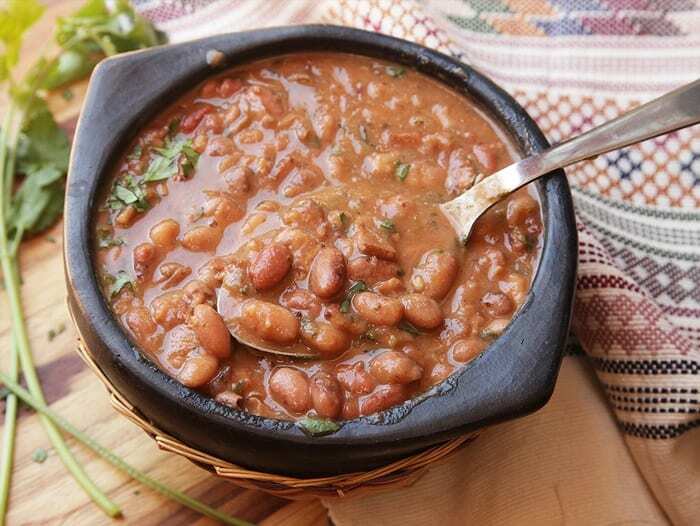 Unlike other iron sources such as red meat, these beans are almost fat-free and very low in calories. One mineral that aids iron absorption and synthesis is copper, and it too can be found in the pinto, along with manganese. Vitamin B1 or thiamin helps our cognitive functions and maintains our good memory. Certain foods (especially preserved ones) that we eat contain substances known as sulfites which can cause problems such as rapid heartbeats, headaches, and disorientation. Pinto beans have a very rare trace mineral molybdenum, which can help people sensitive to sulfites to detoxify their body. Most folks usually don’t have problems with sulfites but those who react to them might have low molybdenum levels in their bodies, and it would be a good idea to replenish them. Mexican food and beans are almost synonymous, and if anyone knows to make these legumes taste absolutely amazing , it is the Mexicans. Now, preparing beans from scratch might sound like a lot of hassle and many people avoid it because they have the wrong ideas about the process. dish in itself, but a base for other bean related recipes. 1. Pour the beans into a large pot and go through them with your hands to remove any undesirable components. 2. Pour 1.5 liters of water over the beans and bring to a boil. 3. After it starts boiling, reduce the heat, cover and let it simmer for about 1 hour. 4. Add all the seasonings except for salt, pour in 500 ml of water, and let it simmer covered for another hour. 5. Taste the beans to see if they are fully cooked and add salt or other seasonings to taste. 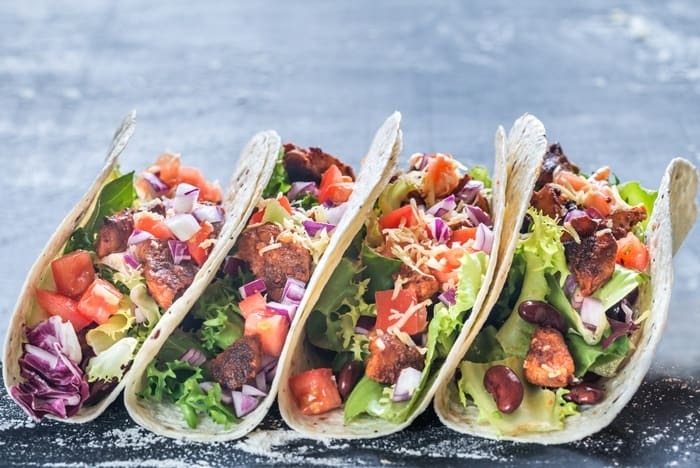 Tacos are definitely one of the most beloved street foods in the Americas, and the vegan versions have become just as popular as the meaty ones. This dish includes cooked pinto beans from recipe number 1, and a variety of veggies and condiments to flavor up the whole package. perfect meal for any time of the day. 1. Take out about 500g of cooked beans from the pot along with the broth. Place it in a smaller pot, heat it up and let the liquid evaporate so that you get a thick sauce. Remove from the heat. 2. Wash and slice tomatoes, jalapenos, and cilantro. Peel and slice the avocado. 3. Open a can of sweet corn and rinse it well. 4. Place a pan over medium heat. 5. Heat up the tortillas about 30 seconds each side. 6. Put the tacos together. Take a tortilla and put 2 tablespoons of bean in it. Top the beans with chopped tomatoes, jalapenos, cilantro, sliced avocado, and a handful of sweet corn. 7. Squeeze some lime juice on the taco before serving. There is truly nothing like a warm, hearty soup for the cold and bleak days. It can cure even the most severe cases of “winter blues,” guaranteed! 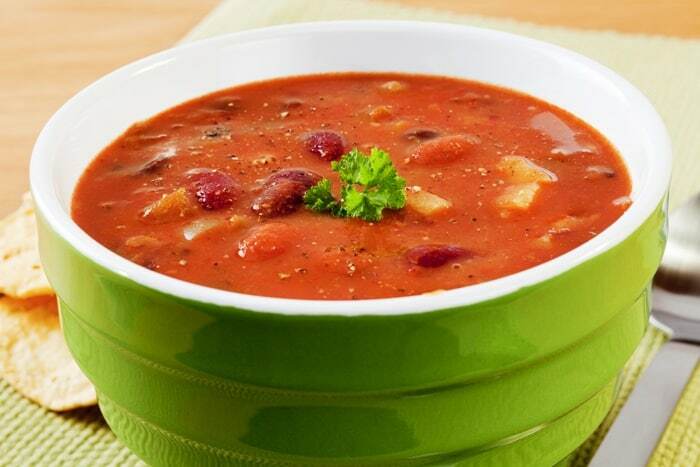 This pinto bean and vegetable soup is healthy and so tasty that it is almost unbelievable. The best part is that it will provide you with nourishing, nutritious, guilt-free pleasure, and all of this with the minimum amount of effort. It is a 100% vegan, and we are sure that any omnivore will be able to appreciate it as much as plant eaters do. 1. Soak the pinto beans overnight. After the beans are soaked, drain the soaking water and rinse them well. 2. Peel and slice the onion, and chop the potatoes, carrots, and tomatoes. 3. Place a pot over medium heat and add the olive oil. 4. Add the onions to the pot. Keep stirring and fry them until they are brown and soft. 5. Add the beans, potatoes, carrots, and onion to the pot and cover with water. 6. Bring to a boil and once it starts boiling reduce the heat to low. Let it simmer for about an hour. 7. Check if the ingredients are soft and cooked. 8. When it is cooked, take an immersion blender and blend until the soup becomes homogenous. 10. Wait a few minutes for the soup to cool down. 11. Serve with slices of sourdough bread. We hope that the facts and recipes provided in this article will inspire you to eat healthier, and show you that beans and vegan dishes can be just as exciting as any other food. All of the recipes provided today can be enjoyed by anyone who loves tasty and easy-to-make meals, not just plant-based eaters. Also, we advise you not to stop here and suggest that you explore more bean-based dishes since the world of legumes is versatile and has a lot to offer. Non-vegans or people who do not have any health problems can certainly benefit from introducing more plant foods in their diet, especially regarding finance. That would be all for today, stay inspired in the kitchen!